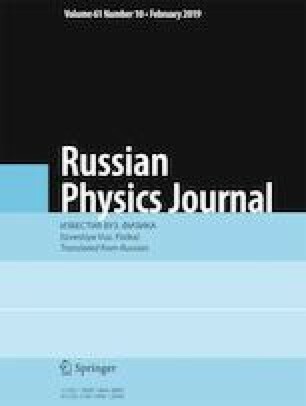 Numerical analysis of the micromagnetic model was used to reveal the ‘resonance’ feature of relaxation processes in nanocrystalline thin magnetic films. This feature manifests itself in the form of sharp broadening of the ferromagnetic resonance (FMR) line at a certain frequency f1 depending on magnetic characteristics of the film, and is observed only in films the thickness of which exceeds some threshold value dmin. Sharp broadening of the FMR line is accompanied by significant shift of the resonance field, whereas the shift value changes the sign at frequency ~ f1. It was shown analytically that the nature of observed effects is associated with the two-magnon process of spin waves scattering on quasi-periodic magnetic microstructure – magnetization ‘ripple’. Obtained expressions for the threshold value of film thickness dmin and frequency of maximum broadening of FMR line f1 agree well with the results of numerical computation of micromagnetic model. Translated from Izvestiya Vysshikh Uchebnykh Zavedenii, Fizika, No. 12, pp. 153–159, December, 2018.